In fact, a recent survey reported that 29% of marketers said their biggest challenge will be proving marketing ROI to their executives. 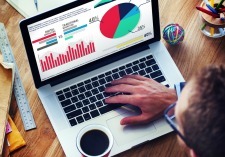 This means that marketing executives can no longer afford to have a sub-par digital analytics strategy, disconnected from ROI. Marketers everywhere are looking to set themselves up for better digital insights—the kind that help you justify spend to the C-suite—and that starts with getting back to basics. In our conversations with customers, we’ve seen a pattern: a complicated digital analytics strategy built backwards from metrics matched to objectives. We espouse a different approach, one that starts with identifying your business goals and digital marketing objectives, then maps the right KPIs and benchmarks needed to achieve your goals. This approach will enable you to build a solid marketing analytics foundation on which to grow and shine. If you were not able to check more than two boxes in any one category, you may need help establishing a better digital marketing analytics foundation. Where is your digital analytics program stuck? Contact us, and let's start a conversation.